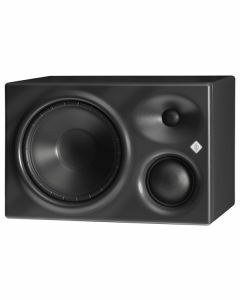 The KH 310 D three-way active tri-amplified monitor features a Mathematically Modeled Dispersion™ Waveguide (MMD™), flexible acoustical controls, various input options (analog and digital) and an extensive range of mounting hardware. This allows the loudspeaker to be used in diverse acoustical conditions, with any source equipment and in a wide variety of physical locations. The KH 310 represents the latest in acoustic and electronic simulation and measurement technologies to ensure the most accurate sound reproduction possible.The KH 310 D is designed for use as a near-field monitor, as a front loudspeaker in mid-sized multi-channel systems, or as a rear loudspeaker in a larger multi-channel system. It can be used in project, music, broadcast centers, OB vans, and post production studios for tracking, mixing, and mastering. Painted wood and polyurethane, metallic anthracite (RAL 7021). 2 x M8 on side panels, depth from outside of cabinet 25 mm (1”). Rear panel screws for attaching LH 41 base plate.